"The underlying fundamentals of our business are very strong." I would wager that most dOc readers, like I do, reach for the arts section of the paper or the sports pages first, and that it would take something deeply compelling to muster up the same sort of interest for the business section. The collapse of Enron had all the earmarks of a corporate story too complex for those of us not steeped in the arcana of the Wall Street Journal to understand—like the S&L scandal of the 1980s, this seemed to be a story about very rich people doing very bad things, and lining their own pockets. (I will admit to knowing about Enron previously only because they were briefly the naming sponsor of the new home of the Houston Astros.) The tale also came with such dense layers of legalities and accounting irregularities, a complicated web clearly designed to obfuscate—I'm thrilled when I've got all the appropriate receipts and information for my accountant each year as he prepares my tax return, so unbundling the corporate malfeasance in the Enron story seemed like a task best left to others. Also, the tale of piggy corporate execs lining their own pockets, destroying their company, and wiping out the retirement accounts of the good men and women who worked hard and played by the rules for years had all the novelty of a Pope Still Catholic news bulletin. But the mantra of this very smart documentary is that this isn't a story about numbers, it's a story about people, and, using the book of the same name by Fortune reporters Bethany McLean and Peter Elkind, director Alex Gibney has made a lucid, compelling film, a morality play or a tragedy rather than a filmed spreadsheet. It's a galling tale, and squarely puts the top Enron executives in the long line of confidence men and rapscallions that comprise a lurid tradition in our nation's history. Theirs is unquestionably the grandest Ponzi scheme of all time, and, as with all pyramid schemes, ultimately the truth caught up with and gave the lie to the salesmanship. Gibney has got his hands on some amazing stuff, and it makes his movie galvanizing—there are galling audio recordings, for instance, of Enron traders, during the rolling blackouts in California, crowing about sticking it to little old ladies, and getting plant managers to shut down, only to drive up Enron's profits and stock price: "We want you guys to get a little creative and come up with a reason to shut down." There were thousands who were drinking the Kool-Aid, but of course a fish rots from the head, and the movie draws damning portraits of those at the top. This starts with Ken "Kenny Boy" Lay, who founded the company, yet professes such ignorance about the day-to-day doings of his firm that he'd almost have you believe that he couldn't find his own office without a map. Even more nefarious, perhaps, is Enron's #2, Jeff Skilling, who preached the mantra of deregulation and talked about Enron's glowing future while simultaneously dumping all his own stock. Andy Fastow was the architect of the matrices of deceit, shell companies named usually after Star Wars characters (Jedi, Chewco), designed to get the debt off the books, and to delude the willfully delusional Wall Street analysts who continued to give Enron stock a buy recommendation—the stock went up 90% in 2000 alone. You need not be an M.B.A. to figure out all of this, though—consider Lou Pai, the Enron exec who ran up huge bills at strip clubs on the company's dime (the re-enactment of his nights out earns this film its R rating), or Skilling's almost messianic belief in his own intelligence, all evidence to the contrary: "We are the good guys. We're on the side of the angels." The film uses archival footage, the occasional re-enactment, and sit downs with Enron apostates—most famous among them is Sherron Watkins, the whistle blower so instrumental in uncovering the layers of deceit. Grim and sanguine in new interviews is Gray Davis; the movie makes the persuasive case that Enron engineered the energy crisis in California, which led directly to Davis' recall, and to Governor Schwarzenegger. Also crucial to telling the story are Elkind and McLean; the latter discusses the corporate firestorm set off by a Fortune story that seems almost sweetly naïve in retrospect, carrying the headline: Is Enron Overpriced? Peter Coyote narrates; deception on this scale—$30 billion or more in debt—could not have been pulled off by just a couple of bad apples, and perhaps the aggressive shredding of tons of documents by Enron's accountants destroyed the paper trail, but the film isn't as successful in connecting the dots about the legion of bankers and government authorities who had to have been complicit. (Of course, the intimacy of Enron with the Bush family is thoroughly gone over.) Also, it seems like a little much to devote so much time to the Milgram experiment, and to the hypothetical and unspecific discussion as to whether or not Enron's employees were in fact evil. But those are just minor missteps in this cogent, persuasive, and well-crafted documentary, which is carefully constructed and argued, and will likely enrage you, even if you were never an Enron stockholder. Image Transfer Review: A solid transfer, with little evidence of scratching or the introduction of debris. Audio Transfer Review: It's all pretty clear—Coyote's narration track is well balanced, and Gibney has a keen ear for appropriate and frequently ironic pop music choices, leaning on Tom Waits especially. Extras Review: The smoking guns are in the feature, but a story of this complexity cannot be told in just two hours, so there's plenty of more outrageous stuff in the extras package. Director Alex Gibney's commentary track is a little ambling, but informative, about the filmmaking process particularly—much of the discussion is given over to technical elements, like editing and the use of music, and Gibney also muses on the inability of anyone discussing the Enron story to escape Titanic metaphors. Four deleted scenes (19m:29s in all) amplify on the corporate malfeasance—especially noteworthy is footage of Lay in handcuffs, and Gray Davis laying out more of the particulars of the energy crisis that plagued his governorship. Gibney and McLean are interviewed in a making-of featurette (13m:55s)—his sister-in-law was a colleague of hers, and got him a copy of the book. They both discuss finding the human scale of the story, and of the self-fashioning by Enron execs that was so much a part of their downfall. Gibney is up again for Where Are They Now? (02m:44s), discussing the legal proceedings: Fastow is slated to be the chief witness against Lay and Skilling, who are preparing for trial. Perspective changes slightly in a conversation (07m:34s) with McLean, which is more of a How I Got That Story piece; her colleague Elkind, in a separate conversation (05m:04s), goes over the challenge of keeping track of a hydra with so many heads. It's McLean again in an excerpt (12m:10s) from High Definition, an interview show; here, she's responding to the movie, about which, unsurprisingly, she's enthusiastic. The story is certainly ripe for parody, and the Firesign Theater takes their shot (03m:17s) in a radio broadcast, which seems more forced than funny�there are more laughs in the accompanying gallery of a couple of dozen editorial cartoons with Enron as their subject. Absolutely jaw-dropping in the feature is a comedy sketch performed by Skilling and other Enron employees, about pulling the wool over everybody's eyes; this was one in a series, and the rest are with the U.S. Justice Department, in preparation for trial. Gibney couldn't get the video, but he reads highlights to us (04m:27s) from other sketches, and speculates on the therapeutic value these may have served, a way for Enron employees to acknowledge, if only jokingly, that something ain't right. The full text of three Fortune articles are reproduced, among them McLean's initial inquiry into the stock being overvalued, and there are a raft of weblinks, so that you can keep up with the ongoing prosecutions. If this movie isn't already on B-school syllabi, it should be—it's a terrific distillation of a hugely complex case, and always maintains its moral compass. There are in fact higher virtues in life than simply driving up the stock price, and for the market to be truly free, there should be no special favors for pals of the current (or any other) Administration. 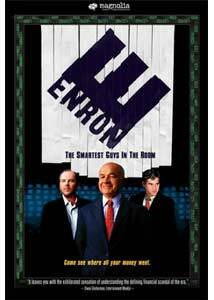 The Enron story is grand in its scale, and conforms in many respects to the rules of tragedy—Ken Lay and Jeff Skilling were undone by their hubris and their continuing belief that they were brighter than everybody else, and could play us all for suckers. The horror story, of course, is that they took so many innocents down with them—even if you're phobic about math and economics, this movie will make you want to learn how to read a corporate balance sheet, and will keep you from having blind faith in anyone whose explanation boils down to a smile, a pat on the back, and those two oh so dangerous words: "Trust me."